Muvezi has been set up in a very unique way. Our programs encourage social enterprise by providing a vehicle for commercial entities to fund international charitable efforts in a sustainable and unique system. Companies with a conscience can designate a portion of their proceeds to become gifts of health that are given to the world’s impoverished. A portion of corporate profit becomes the source for sustainable humanitarian work. In short, Muvezi helps companies carry out goodwill projects, all while not relying on individuals for donations. Muvezi provides health supplies to people in need, providing relief from infectious conditions. These donations typically come in the form of Love Silver. Distribution occurs through a network of partners that have established operations in impoverished countries around the world, minimizing costs while maximizing distribution effectiveness. Several commercial organizations make contributions to Muvezi Health Projects Society. Here are two examples of organizations that have supported us for several years. Sales of stunning stone sculptures from Zimbabwe fund the creation of silver products or cash donations to local organizations with every purchase. 20% of revenue from each sale is dedicated to this end. In addition, financial stability and silver health products have been provided to 200 stone carvers and their families in Zimbabwe, a nation suffering from complete economic chaos. With a collection of over 3000 sculptures, this is the largest collection of Shona art in the world. Sculptures are for sale through galleries in Mexico & Canada, and online at www.Muvezi.com. This project is run by Muvezi Inc., a Canadian business with operations in several countries. Muvezi Inc. is separate from the registered charity, Muvezi Health Projects Society, though the two organizations have a history of cooperation. Additional images from this project can be seen here. Sales of Guardian Silver fund the provision of silver to impoverished communities. 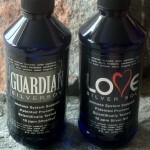 These gifts include Love Silver and Guardian; liquid and gel. For every 5 ounces of Guardian Silver that is purchased, at least 1 ounce of silver is provided free of charge to the destitute. In this way, the health benefits of silver are being taken to all of humanity; to those who can afford it and those who can’t.